Lunar New Year is always a complicated time for me. It’s mostly jubilant—what with red envelopes, an abundance of so many of my favourite foods, and my mom voice ringing through the house she draws out a big belly laugh out of even the most shy of babies. I’m not sure how she finds them, or how they find her, but my mom is a baby magnet that always manages to have someone’s baby on her hip or clinging to her leg because they’ve fallen in love with her charm. 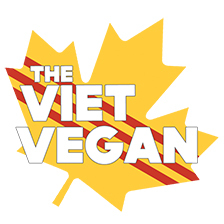 As some of you may know, the Vietnamese calendar is based off of the Lunar New Year—so our new year changes each year. This year its on Jan 29th, and it’s the year of the rooster! It’s a fresh start, it’s a new year for opportunities and hopefully good fortune. I didn’t believe in horoscopes for a really long time, I just thought that they were generalizations. They’re always so vague so they apply to anyone, but when I turned 24, I started to really doubt that. Apparently, your “year” (for me it’s the year of the horse) is the year you need to be the most cautious and careful. It’s considered a rather “unlucky” year for people. Me being me, I just ignored it and didn’t think anything of it and just lived my life as usual. That year was a pretty rough year with a lot of ups and downs. I got a new job; my eczema got a lot worse; I fell out of love with academia, then decided to stop pursuing my thesis and just finish my Master’s through coursework; and that year was the beginning of the end of my relationship with Chris. Maybe it was just a bad year in general, maybe it’s unrelated to the horoscope, but who knows. Maybe there’s some truth to the stars. 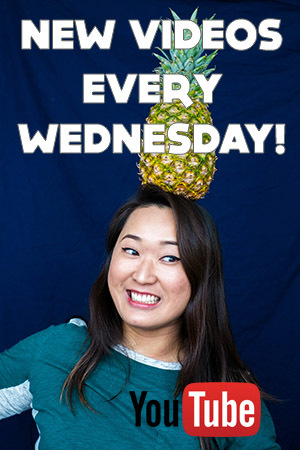 I’ll be trying to record a video version of this che ba mau recipe for Wednesday, so if you want to see how I make it, just stay tuned for that. I have another video where I had it from a restaurant if you want to see what it looks like and how to eat it. Otherwise, I hope you try this sweet three colour bean dessert out! It’s a little different from Western concepts of dessert, but it’s really delicious! Soak the split, hulled mung beans (they're yellow) in about 4 cups of water overnight. Alternatively, you can just soak them for about 1 hour in warm water before you start making this dessert, it's better when soaked overnight though. Rinse and drain the next day. Using a steamer, arrange the mung beans on one of the perforated steam layers and steam over medium heat for about 20 or until they're very soft. If you prefer the soft, mung bean mash type texture, you could cook them in a pot in about 1 1/2 cups water until they're soft. You could then mash with a potato masher or hand blender until you get that really thick texture (adding water as desired). In a small pot over medium heat, combine agar agar powder, sugar, water and stir well until the agar has dissolved (the water will look clear). Stir in the pandan flavouring and then pour into a glass container (you can use one of those glass sandwich ones, I ended up using a glass pie pan). Let cool and set completely in the fridge for about 2 hours. Once those are set, cut into jelly strips (about 1.5 inch long and maybe 1/4 thick). Set aside. In a small pot (or alternatively the microwave), heat sugar and water until sugar is completely dissolved (water will look clear). Set aside to cool. Combine the coconut cream and sugar and heat until sugar is dissolved. Set aside. 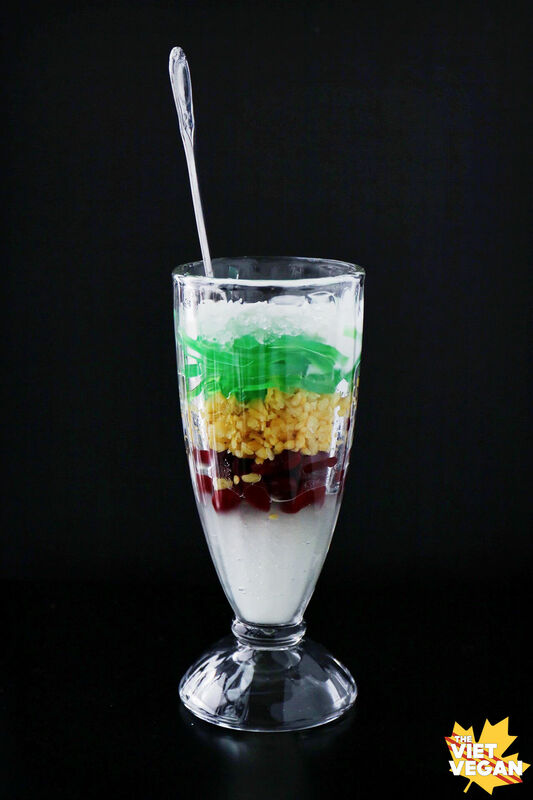 In a tall glass, add 2-3 tbsp of crushed or shaved ice, 2 heaping tbsp of the kidney beans, another 2 heaping tbsp of the mung beans, a layer of the pandan jelly, more shaved ice, and 3 tbsp each of the sugar syrup and sweetened coconut cream. What a pretty dessert for the Lunar New Year! This reminds me of Chinese shaved ice - very similar. Happy Chinese New Year Lisa! I have never tried this, but being an Indonesian, we have quite a few desserts that look like this :) I am betting that this must taste just as awesome. This looks great! Happy new year! Hey Lisa, I'm off gluten too but will have it once in a while if it presents itself as, say, a vegan birthday cake. ? I think dairy is the bigger problem for me. Hope you'll manage to get to the root of the problem soon. Eczema is stressful. Thanks for sharing this dessert recipe. I've always wanted to know what goes in there. May your new year be filled with sweetness! I can totally eat this any time of year XD Thanks, you too Lisa! I loooooooove these kinds of drinks!! I used to work in SF's Chinatown and there was a little shop called the House and they used to sell this dessert drink and I can't find it anywhere any more as boba drinks have taken over the world, ha! Thanks for the recipe. Happy #sweetlunarnewyearBTW, I'm really sorry you are having issues with eczema. It could be caused by any food, you can probably figure it out faster by seeing an allergist and getting some skin tests or seeing a dermatologist. We deal with eczema in our family, f you want to email me, I can share what works for us and you can discuss with your doctor. Feel better! Where can i find red kidney beans in hcmc? It's Vietnamese jelly :) So kinda crunchy!